Saboteur. In this semi-cooperative game, you're dwarves mining for gold when suddenly, the pick-axe breaks, and the lantern goes out. The saboteur has struck again! 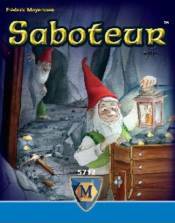 In Saboteur, you play dwarves digging for gold in the depths of a mine when suddenly, the pick-axe breaks, and the lantern goes out. The saboteur has struck again! But who is the saboteur and will he (or they!) stop you from reaching the treasure? If you succeed, gold awaits you. If you don't, then to the victor goes the spoils. Whoever has the most gold nuggets after three rounds is the winner. A 3-10 player path-laying card game where each player has a role and no one knows for sure what that role is.